Majority of ovarian cancer (OC) patients are usually diagnosed at advanced stage and present with peritoneal spread/ascites. Some patients develop pleural deposits/effusion secondary to transdiaphragmatic spread of peritoneal disease/ascites. However, pleural deposits/effusion from OC in the absence of peritoneal disease/ascites are very rare. We present a case of serous carcinoma of the left ovary with fluorodeoxyglucose (FDG) avid right pleural deposits and effusion in the absence of peritoneal disease/ascites on FDG positron emission tomography (PET)/computed tomography (CT), showing excellent response to chemotherapy in subsequent PET/CT. We also discuss the pathophysiology of pleural abnormalities in patients with ovarian diseases, a characteristic disease spread pattern and recognition of which would help in the imaging interpretation. More than 75% of all ovarian cancer (OC) patients are diagnosed at Stage III or IV since early OC causes minimal, nonspecific, or no symptoms. Majority of OC patients usually present with peritoneal metastases/ascites, and a significant number of patients develop pleural deposits/pleural effusion (PE), predominantly on the right side., Pleural involvement is commonly attributed to transdiaphragmatic spread. However, pleural metastases from OC in the absence of peritoneal deposits/ascites are extremely rare. It is also noteworthy that the relatively common pleural involvement and right-sided preponderance in OC patients can be related to the pathophysiology of well-known Meigs' syndrome (a triad of fibrous ovarian tumors, ascites, and right-sided PE) and its variants associated with benign ovarian tumors. 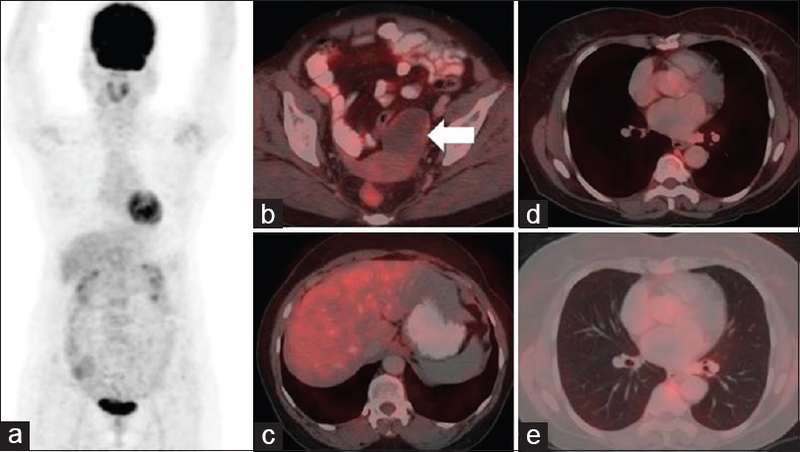 In this case report, by demonstrating isolated fluorodeoxyglucose (FDG) avid right pleural deposits and effusion from OC in the absence of peritoneal spread/ascites on F-18 FDG positron emission tomography (PET)/computed tomography (CT), which showed excellent response to chemotherapy, we discuss the pathophysiology of this characteristic disease spread pattern and its implication in imaging interpretation. A 63-year-old woman presented with lower abdominal distention of 3-month duration associated with loss of weight and early satiety. Ultrasonography showed a complex left ovarian mass, suspicious for malignancy. Her cancer antigen 125 value was very high (1254 units/ml). Trucut biopsy from left adnexal lesion showed serous carcinoma. F-18 FDG PET/CT [Figure 1] showed a large complex solid cystic adnexal lesion with internal septations on either side as well as posterior to the uterus, showing increased FDG uptake in enhancing solid components and along septae. No other FDG avid lesions/lymph nodes or ascites were seen in the abdomen. However, there were FDG avid enhancing deposits in the right-sided pleura and along right major fissure as well as low-grade FDG avid right PE, suspicious for metastases. In view of isolated pleural lesions in the absence of intraabdominal metastases, histopathological examination (HPE) was suggested to rule out the possibility of primary pleural malignancy. Since neoadjuvant chemotherapy (NACT) was being planned, pleural biopsy was deferred and decided to consider only if pleural lesions show poor response to NACT. 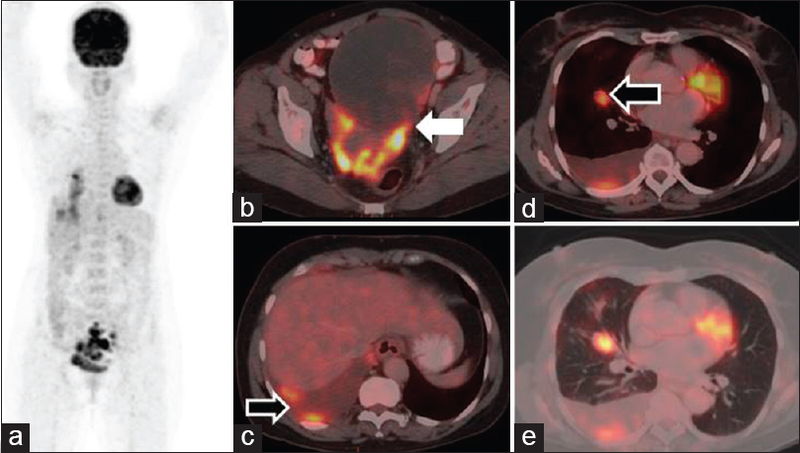 The patient received three cycles of NACT (paclitaxel and carboplatin), and subsequent F-18 FDG PET CT [Figure 2] demonstrated significant interval reduction in size, extent, and metabolic activity of ovarian mass along with near-complete resolution of right pleural deposits and effusion, confirming the nature of pleural lesions as metastases from OC. Later, she underwent cytoreductive surgery, and HPE showed multiple residual foci of serous carcinoma in the left ovary as well as few tiny foci of tumor deposits in the peritoneum. The pleural cavity constitutes the most frequent extraabdominal metastatic site in OC, secondary to transdiaphragmatic migration of disease from the peritoneal cavity. However, isolated pleural abnormalities in the absence of peritoneal deposits/ascites are extremely rare and may warrant HPE confirmation to rule out the possibility of other pleural pathologies such as primary pleural malignancy or infections such as tuberculosis, particularly in developing countries. There is another rare variant known as atypical Meigs' syndrome, which is characterized by a benign ovarian tumor and right-sided pleural effusion but without ascites., The possible reason behind the absence of ascites is transport of all ascitic fluids through tiny transdiaphragmatic defects covered by pleuroperitoneum. These defects act as one-way valve due to high abdominal pressure as well as negative pressure within pleural space, resulting in migration of all fluids in the abdomen to the pleural cavity., This concept can be extrapolated to ovarian malignancies as well. Migration of almost all the disease from the peritoneum into pleural cavity might be a reason why pleural deposits occurred in the absence of peritoneal disease. Postoperative HPE demonstrated tiny microscopic peritoneal tumor deposits (which could not be identified on imaging as there was no macroscopic disease), which supports the transdiaphragmatic spread theory in this case too, probably with one-way valve mechanism. This case emphasizes the fact that FDG avid pleural deposits/effusion, particularly on the right side in a known case of OC, are very high likely to be metastases from OC even in the absence of identifiable macroscopic peritoneal disease/ascites on F-18 FDG PET/CT and may not warrant routine HPE confirmation unless there is any strong suspicion of other etiology clinically or on imaging. Ozols RF. Update on gynecologic oncology group (GOG) trials in ovarian cancer. Cancer Invest 2004;22 Suppl 2:11-20. Jelovac D, Armstrong DK. Recent progress in the diagnosis and treatment of ovarian cancer. CA Cancer J Clin 2011;61:183-203. Porcel JM, Diaz JP, Chi DS. Clinical implications of pleural effusions in ovarian cancer. Respirology 2012;17:1060-7. Saha S, Robertson M. Meigs' and Pseudo-Meigs' syndrome. Australas J Ultrasound Med 2012;15:29-31. Miyoshi A, Miyatake T, Hara T, Tanaka A, Komura N, Komiya S, et al. Etiology of ascites and pleural effusion associated with ovarian tumors: Literature review and case reports of three ovarian tumors presenting with massive ascites, but without peritoneal dissemination. Case Rep Obstet Gynecol 2015;2015:414019. Martin F, Brouche S, Haidar A. Demons-Meigs' syndrome. Report of a case with ovarian tumor of the granulosa. Rev Pneumol Clin 1990;46:123-4. LeVeen HH, Piccone VA, Hutto RB. Management of ascites with hydrothorax. Am J Surg 1984;148:210-3. Kirschner PA. Porous Diaphragm syndromes. Chest Surg Clin N Am 1998;8:449-72. Guest S. The curious right-sided predominance of peritoneal dialysis-related hydrothorax. Clin Kidney J 2015;8:212-4. Overholt RH. Intraperitoneal pressure. Arch Surg 1931;22:691-703.